Six Ladipo Market traders have been arrested and paraded by the police for their alleged involvement in armed robbery and cultism in Lagos. They were paraded by the Lagos State Commissioner of Police, CP Imohimi Edgal at the Police Command, Ikeja, Lagos. Nwapa Chukwuebuka, 20, Oganna Effita, 22, Seth Frank, 29, Obiora Nwagbaso, 20, Chibike Ozor, 25 and Moses Ikechukwu, 25. The traders were among other suspected criminals paraded by the police for committing various criminal offences. 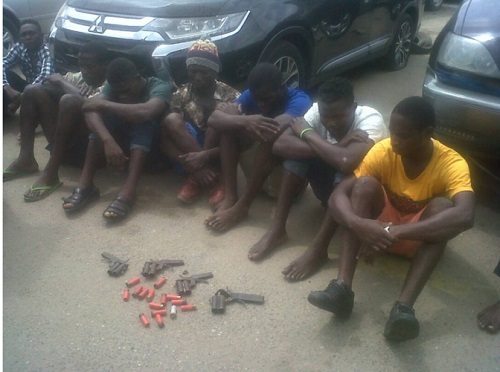 The police boss said that the suspects were arrested by the operatives of Federal Special Anti-Robbery Squad, FSARS, through intelligence gathering which led to the arrest of Chukwuebuka. He confessed and took the police to NNPC area at Ejigbo where they hid their weapons. The house was resided by one of their leaders identified as Uzor now on the run. Edgal said that the confession led to the recovery of four short locally made pistols and live ammunitions at their armoury. He said that it also led to the arrest of other suspects at the market. They were arrested and brought to the Command at Ikeja, Lagos. During the parade, the suspects confessed belonging to various cults and mentioned their leaders who were now on the run. CP Edgal said efforts were being made to arrest other suspects but those already arrested will be charged to court. Edgal promised that the police will continue to do their best to reduce criminality in Lagos and asked for continued support from the public.